On Thursday, district spokeswoman Ambria Washington confirmed the ongoing inquiry in an email to The Lens. “Due to recent information that has come to light after our initial investigation, OPSB is continuing to look into the matter and is in regular communication with the New Beginnings School Foundation,” Washington wrote. New Beginnings did not immediately respond to a request for comment on this story. As The Lens reported last week, the former administrator, Runell King, suspects that school employees changed students’ final letter grades from F’s to D’s and D’s to C’s in an attempt to give students credits they didn’t earn. At least 17 students in Algebra III moved from an F to a D, he said. New Beginnings’ CEO Michelle Blouin-Williams said the grade changes resulted from a correction to the way certain assignments factored into final grades. She said the school’s grading software, PowerSchool, initially miscalculated the grades. A screen capture of one of New Beginnings’ algebra teacher’s gradebooks. 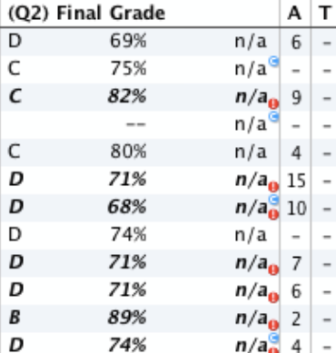 The red symbols denote a manual override for the final grade. King challenged the school’s explanation, saying that if it were true, every grade in the classes would have changed. But it only happened for some, he said. The school has not addressed that question nor has it answered questions about a mark that appeared next to several students’ grades in a screenshot of a gradebook obtained by The Lens. The mark, a red exclamation point, indicates a manual override. An internal investigation by New Beginnings found nothing to substantiate King’s allegations. And last week, the school district said it looked into the matter and found no evidence of wrongdoing. But the district is now taking a second look. King said the district’s head of charter school compliance Kelli Peterson called him Thursday. He said another individual was on the line too. “Can you just explain to us what happened again?” King said he was asked. The Algebra III teacher, Gloria Love, resigned from the school for personal reasons. King thinks her grades were targeted for inflation because she no longer worked there. King said he provided the grades in question to the district during the initial investigation. Louisiana’s open meetings law allows public bodies, like the charter board, to discuss “investigative proceedings regarding allegations of misconduct” in private. But any action, such as a board vote, must occur in public. King said he is glad the district is continuing to look into the matter.